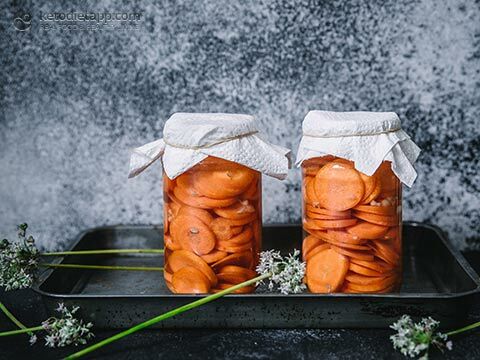 These fermented carrots are by far my favourite way to make fermented vegetables. Great for gut health, fermented veggies also make a crunchy, tasty topping to most savoury meals – I throw some on my stews, salads, and curries before serving, or enjoy them as a side with fish or meat. 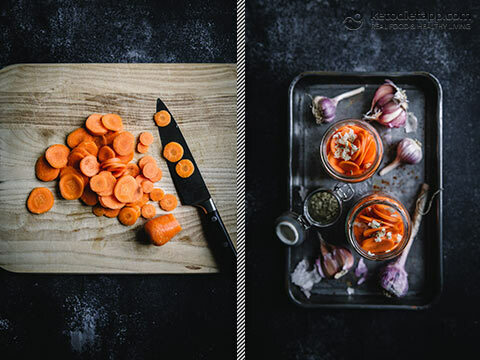 The recipe below uses garlic, caraway and chili to flavour the carrots (though I usually omit the chilli as I’m not a fan of spicy food, my partner much prefers it with!) but you could try other flavourings here too – bay leaves, sliced ginger, peppercorns, mustard seeds. So many options depending on which flavours you like. When making fermented vegetables, it’s best to use organic or spray-free produce where possible to ensure that there are no pesticides present which may interfere with the fermentation process. If you don’t have organic vegetables, make sure to wash all of your produce thoroughly. Make sure to use clean jars – I put mine through the hottest cycle in the dishwasher, but you could also sterilise them in boiling water. The amount of time your vegetables will take to ferment will depend on many things; the temperature inside your house, the quantity you’ve made etc… Start checking after about 2–3 days. 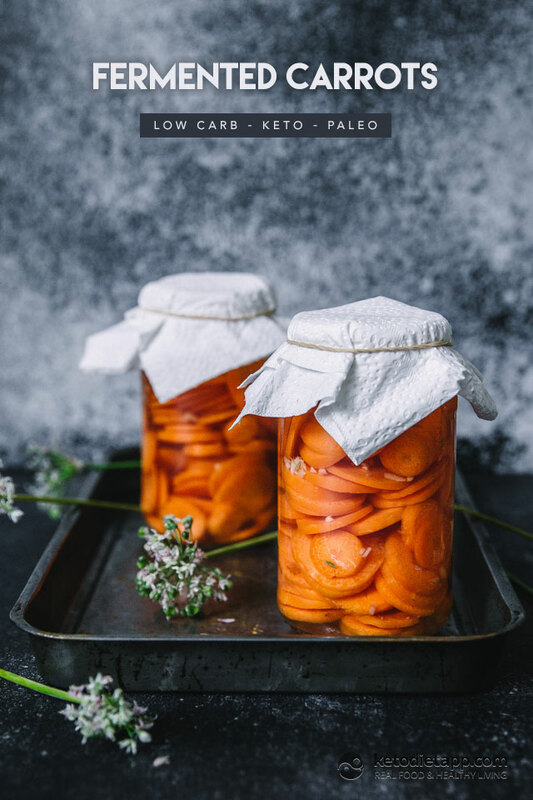 Your carrots will be ready when you open the jar and there is a sour (think vinegar-y) smell, and bubbles start to travel up the inside of the glass when tapped or moved. At this point, transfer to the fridge, where they will continue fermenting, but at a much slower pace. Note: Carb count in fermented vegetables varies and depends on the level of fermentation (ie fermentation lowers the carb count). 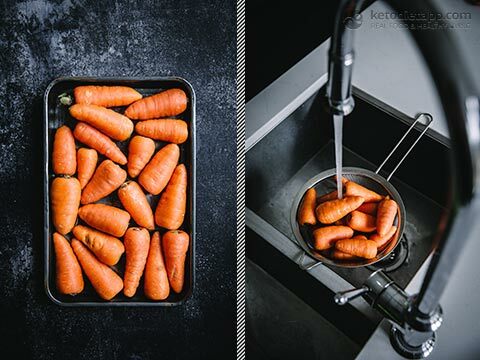 Thoroughly wash the carrots, then peel and slice them. 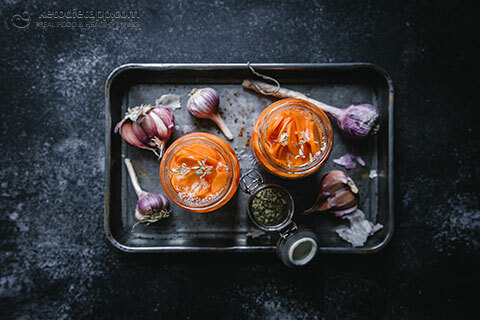 Place the chopped carrots in a large glass jars or two smaller jars. Top with the garlic, caraway and chilli. Make the salt brine by mixing one litre of lukewarm water with the sea salt and stirring until all of the salt is dissolved. Pour the starter culture evenly into the jars, and then pour in the salt brine. Make sure to cover the carrots completely with the brine. Place an airtight lid on your jars, and leave to ferment in a cupboard or on a shelf away from direct sunlight for 2-4 days. Store in the sealed jar in the fridge. The fermented carrots will last months. Fermented vegetables that have turned ‘bad’ will start to dull and even go grey in colour, may develop mould and will take on a really off, pungent flavour and smell. Can I use probiotics instead of sauerkraut juice to start the fermentation process? Do you have to burp the jar daily? Not if you use fido jars (the ones with a rubber rim like I used here: Easy Homemade Sauerkraut). These are perfect for fermenting as they release the pressure but don't let any air inside. 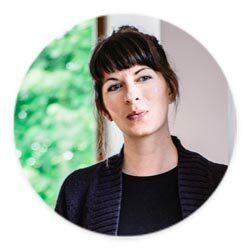 Is the kombucha starter that you refer to the actual scoby or just some of the fermented tea? Hi Sylvia, it is the liquid part so you can either use 1 tablespoon of whey, 1 tablespoon of sauerkraut juice or a tablespoon of kombucha. I use the juice from my sauerkraut for most fermented veggies (where needed). Dr. Berg explains how ketones work as an alternative fuel source to glucose and why they are more efficient for the brain and the heart. I do recoommend this to everyone interested in the topic. For best results, it’s important to use a lid. If you have airlock jars with rubber seals, they work great. These particular jars have plastic lids so I use the paper towel (or some cloth) in between to make them more airtight. Often with ferments while they’re fermenting just put your lid on then burp them a few times a day or invest in an airlock lid that has the gas release piece for the top. Another method would be to put a lid on loosely to allow gas escape. I use a Fido jar - it works great for fermenting as it allows air out while no air gets inside. I hope this helps!